If reviews can work well online, why not use them in an offline setting? This ad for Sonos, shown on the underground last year, is simplicity itself. And, if you Google the term, you’ll see lots of sites with four or five gold stars for Sonos products. Very persuasive. Of course, you need to have a great product and reviews for this, but it’s a great tactic. Alternatively, you could display review scores, quotes etc on the ads themselves. A Kia TV ad from last year used the airtime to display the number of positive reviews Kia had received about its cars. Not only was the use of reviews in an ad innovative, but Kia also ensured that the campaign was joined up, with reviews prominently displayed on landing pages. As well as the usual info on opening hours and location, Schuh has added customer reviews of each store to its store finder. Whether this helps conversion here is debatable, but I’d imagine it helps to keep staff on their toes. Schuh again, and this time reviews of its stores are likely to help increase footfall. Using Google+ Local should be a no-brainer for businesses with an offline presence as it offers greater search visibility and the opportunity to advertise to local searchers at no cost. Here, the reviews are generally positive and should help persuade people to make the journey to the store. Also, these results appear in non-brand search results for local searchers for terms like ‘shoe shops’. Consumer reviews on ecommerce sites shouldn’t just be confined to product pages. Instead, think about how you can use them to send people to product pages, or to help their product selection. Here on Best Buy. users can select average review scores as a filter alongside other product features. Reviews can be used to determine which products customers really appreciate and to promote them. Italian retailer Marcopolo has an app which has been designed for in-store use. As retailers look to combat showrooming, making reviews easy to find for in-store shoppers is a very smart idea. Here, customers can scan QR codes (yes, a good use of QR) on the shopfloor to be shown reviews and other product information. As retailers look to combat showrooming, making reviews easy to find for in-store shoppers is a very smart idea. This means customers don’t need to search elsewhere for this information, including on competitors’ sites. If you have reviews on site, this is an easy win. 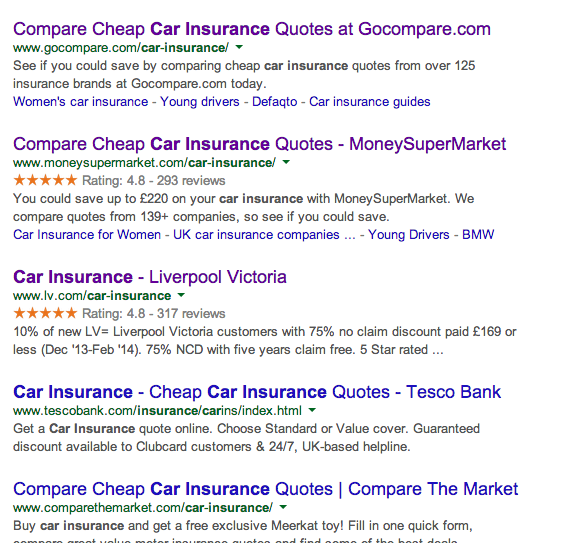 Here, both moneysupermarket and LV use Schema markup to show average review scores in the search results. Gocompare may have pipped them to the top organic slot, but these two results stand out more thanks to the star ratings. Why not? Social proof can work offline just as well as online. Here’s an example from Currys’ brochure. While it’s good to provide mobile users with easy access to reviews vis in-store prompts, there is a case for cutting out the middle man and just showing reviews on the shelf.